Are their blank spots around the house that cause you to lose Wi-Fi signal? Don’t you wish to boost the Wi-Fi signal around your house with the help of a simple, yet effective way? Well, scientists have found the easiest way to boost the Wi-Fi signal around your house. And the best part is, it is easily available in any kitchen and is very, very cost effective. It is none other than an aluminum foil. Just use the aluminum foil as to shape the flow of your Wi-Fi signal and give your network the much needed speed and coverage. The following article will cover the simple method for improving Wi-Fi signals using aluminum foil. 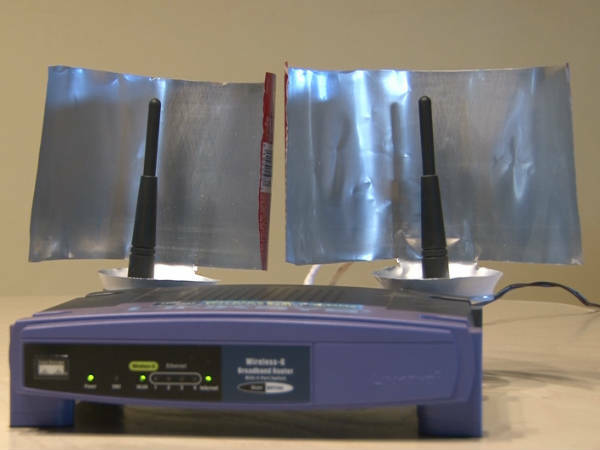 How to Improve Wi-Fi Signal Using Aluminum Foils. Before we move on to the method to improve Wi-Fi signals using aluminum foil, let us make sure if your router or modem is placed in a wider range. Your router or modem should be kept in an open place and should not be covered by walls, wood, furniture or other metal obstacles. It should be placed at an higher place so that it can be detected easily by most devices. Do not place it under a table, behind a desktop PC or behind a bookshelf. Make sure the number of devices connected to your router do not exceed the stipulated standard. These points are very important as it can cause your Wi-Fi signal to become weak and disturbed. Now, after making sure all these points are clear and not causing problems with your Wi-Fi signal, then it is time to make our very own Wi-Fi booster using aluminum foil. Take a piece of aluminum foil and cut it into a shape of a rectangle. Make sure you take a large piece and fold it 2 to 3 times into a rectangle. This will make it a stronger and hold on better. Fold its sides so that they form a curved shape and you could use a cardboard roll or an bottle to help you give it the needed shape. If the aluminum foil is not able to stand, then place thick papers or cardboard around it to allow it to stand on its own. Place this curved, rectangle piece of aluminum foil near the antenna of your router. This will help the signal get amplified and focus on the blank spots around the house. If you have a wall mounted router, then punch two holes in your aluminum foil and place it on the antenna. Once the aluminum foil is placed on near the router, you will definitely find improvement in your Wi-Fi signal. It is cheap and easy to do method of boosting a poor wireless network signal without spending money on an expensive Wi-Fi extender.